Mesh Grease Filters are generally installed in the kitchen canopy above cooking ranges, fryers, and gas hobs in commercial restaurant kitchens. These air filters effectively eliminate or greatly reduce grease build up in duct work and on fans in the kitchen extract system. 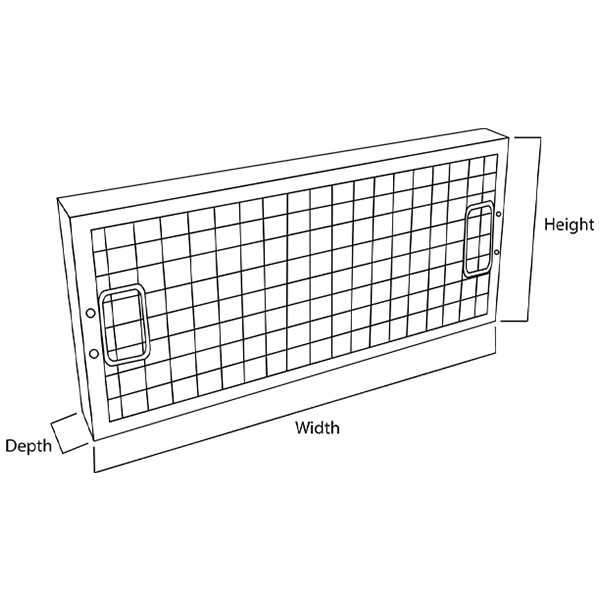 Mesh Canopy Filters significantly reduce the frequency of expensive duct cleaning, and offer some protection against grease-fire hazards. Airclean now have many thousands of mesh grease filters operating satisfactorily in leading restaurants, hotel kitchens and ship’s galleys. The grease filtration media is a crimped galvanised knitted wire mesh, that is enclosed in either an aluminium or galvanised channel frame. Galvanised steel retaining meshes are fitted to both faces of the grease filter, and corner plates provide rigidity. Handles are normally desirable on grease filters for ease of removal and cleaning, but these are optional. Drain holes also provide an outlet for grease to drain away from the filter into drain trays and grease traps. Stainless Steel Mesh Type Grease Filters are available and these can be found as our Gridmesh Style Grease Filter. See AC3.4 Stainless Steel Gridmesh Grease Filters for further information. For information on the New Style Baffle Grease Filters Click Here.